Virtually, the most reasonably priced RV Park/ Property Management Program in the market with the Simplicity, Features and Capabilities you need. 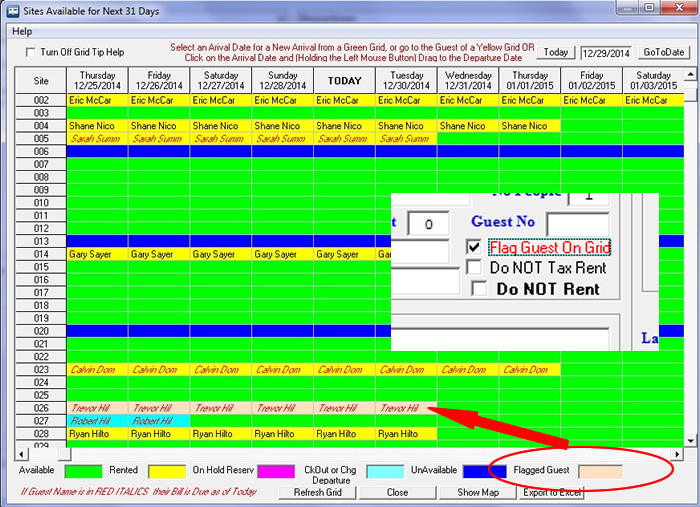 We provide you with a simple tool to define up to 4 Park Maps in our Software ... included ... No Extra Charge!!!! In Fact, there are no extra charges for virtually anything. The software was developed because a Customer in Texas bought one of the more expensive applications that was too confusing to use. 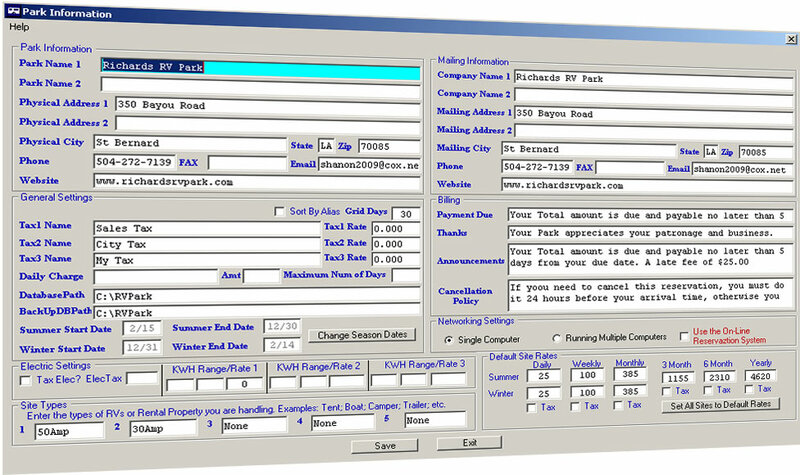 They wanted a simple tool to manage their Guests and reservations in an RV Park Campground. However, it could be used for Motels, apartments, or virtually any rental properties. The program was designed for small parks, with typically around 300 or less Sites (but we have Customers with over 700 Sites) and to make use of things you already have and not need to purchase other things. Because of this, you would continue to use your current Credit Card processing (RV Park Software does not process the transaction through a Gateway that costs more), you use the standard Windows based PC and a standard 8.5" printer (3 & 4" printers are not supported). The goal is to use what you already have and just make it a LOT easier to keep financial and Guest records. The tool is full of features and capabilities, but you won't be charged for how many sites you have or if you want to run it on multiple computers, or if you want the next version, etc. like the $800+ software. This Software has a one time charge and you get everything for just $425.00. New: Lite version for Corporate or a remote located Owner to get reports and activity monitoring through an auto-emailed copy of the database. See HERE for more information. The Trial or Demo version has it all, it is not watered down version. It is the complete tool, there is just a time limit on how long the evaluation lasts ... 30 days is usually enough, but if you need more time, you can download a code for an additional 30 days for a 60 day evaluation. There is even a 90 day code you can get by Emailing us if you need it. We want you to know what you are getting and be happy with it. 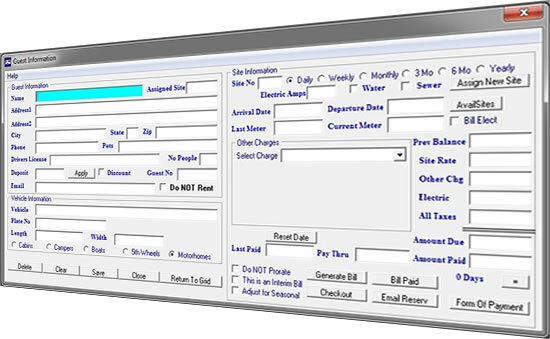 No extra charge for Networking to other Computers; no charge for Point of Sale capabilities; no charge for maintenance or updates; no charge for on-line reservation tool; no charge for Maps: simply no other charges!!! All that said, if you have a park with less than 25 sites, please Email us with your Park's Name and the number of Sites (after you try RV Park software) and we may be able to offer you a discount on the purchase. The only additional cost there could possibly be is if you got a new computer or your hard drive crashed and needed to be replaced, and that is only $100 for a replacement license. This is a Windows ONLY Application. Other Pricing Info: If you replace or lose (hard drive crashes) your Licensed Computer, there is a $100 license replacement fee. This is the only possible other charge we have, unless your support hours get too excessive (over 5, which does NOT include actual software issues being reported). Multiple Park Licenses: If you have Multiple Parks (different locations), you can purchase additional licenses for $250 for each additional business location.